One of the biggest I questions I get asked is, what is Classical Pilates? So, in this blog post I am hoping to clear this up for you. Classical Pilates is a discipline created by a man called Jospeh Pilates. The exercises have been developed by Joseph Pilates over time on various apparatus, which he designed. The Reformer, Cadillac, Barrels, Pedi Pole, Magic Circle (to name a few) were all created to give the user feedback and resistance, which, in turn helps to create length in the spine, lift, open, stretch and tone the body. In today’s Pilates market, there are many variations of the The Method (Pilates). 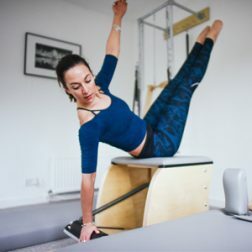 Whilst each of these classes have their place, often these variations are Pilates based and confused with: core work, stability and physio based classes, they are not pure Pilates classes. The true success of Pilates comes when you work his full system. That being: The studio apparatus and mat work. The Joseph Pilates system (mat and apparatus) has been carefully designed to work all ranges of movement of the body. As you develop you are introduced to more challenging exercises. A Classical mat class follows a set structure and you work through the system starting with the hundreds, and you finish standing after your press ups. As you progress, more and more exercises get dropped in but the class structure largely remains the same. The class is a workout and it flows, seamlessly from one exercise to the other. As you progress and get stronger the class becomes more cardio based as more exercises are dropped in to the same class length, the flow increases and therefore so does the sweat! How Joesph Pilates used to work was he’d welcome his client’s to the studio he would then guide them around the whole studio working the full system on all the apparatus. He would teach them mat work, this was homework. He would ask them to practice their mat exercises at home and then come back next week when they would work the studio again adding in more exercises as they improve. Their training would continue like this and huge improvements were seen, which is why Pilates is so popular today. The classes that I offer range from the true method: Classical Mat right through to HIT Pilates. HIT Pilates would be unrecognisable by Joesph Pilates. These classes are simply hybrids, a modern twist on a method that works. It is not Pilates, strictly speaking. My Contemporary mat classes are the modern approach to Pilates too. They definitely have key principles of Pilates within them, and there are many many Classical Pilates exercises within the class. But the order is different, we use bands, balls (none of these would have been used by Joseph Pilates traditionally). As I said before there is a place for all this work, it’s all great stuff but if you want to learn true Pilates, then the classical mat and studio work is where you want to be. The contemporary twists suit many people today as they offer: variation, small equipment, music and sometimes, mindulness. My goal with Brighton Pilates is to offer classes that enthuse everyone to come along and enjoy the benefits that Pilates has to offer. I accept that the Classical Method isn’t for everyone. I accept that some people would scowl at me for offering ‘HIT Pilates’ as this is ‘not Pilates’. But, my mission as a Pilates teacher is to deliver fun varied classes that suit everyone. I always encourage all my clients to come to the studio before starting Pilates (of which most of them have). This is so I can teach The Method and explain the origins to all new starters. From there, everyone can choose which Pilates path suits them. In an ideal world, all my clients would do a studio class once a week, a mat class once a week and for their cardio needs, a HIT class once a week. This really does cover all bases. For those that would like to do that. I offer an ‘Intro Package’ which offers a 1:1 classical studio session and a flexi pass where clients can book onto all the classes that I have on the timetable. I believe as a Pilates teacher it is my job to teach clients what Pilates is and it’s history but which approach they choose to take and which class they prefer, that is up to them ultimately. All I hope for is that everyone who comes along enjoys moving as much as I do. I can also promise that whichever class you chose, they will always be: safe, fun and friendly.